An aged, hard cheese frequently used in Italian cuisines which has been ground into fine crumbs. The term "parmesan" can apply to all cheeses similar to Parmigiano Reggiano. Parmesan is a somewhat generic term for what has become an amalgamation of regions, techniques, and qualities. The original Parmesan is the Italian Parmigiano-Reggiano. This name is strictly regulated- it applies to only Parmesan from the Italian regions of Bologna, Mantua, Modena or Parma (Parmesan's namesake) that has been aged at least 12 months and was produced from cows raised under certain standards. Parmigiano-Reggiano is easily identified by the dotted heat brand applied to the outside of each wheel of cheese. Once Parmesan is cut from the wheel, it's fairly perishable. Pre-grated Parmesans are often treated with fillers and lack Parmesan's distinctive saltiness and sandy texture. Parmesan has been ejoyed in Italy for over nine centuries. 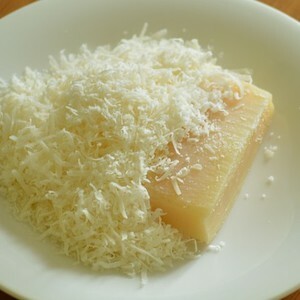 Parmesan cheese will melt, but it is not a melting cheese, so it's not a common base for cheesier dishes. It's often a garnish on pasta and chicken dishes, sprinkled over vegetables, and blended into fillings and sauces to add richness and bite.